Is it time for you to buy new HP 3940v printer ink? At some point your HP 3940v will use all of your printer ink, and when it finally happens you'll see that replacement HP 3940v ink is often quite pricey. However, you don't have to be anxious about dishing out the high costs you'll uncover on the high street because now at Cartridge Save you can get all the HP 3940 v cartridges you'll need at very competitive prices. Save money on your ink by ordering online with Cartridge Save! There's little sense in paying so much for the 3940-v original cartridge or 3940v compatible ink down the high street when you can easily save money ordering with Cartridge Save. You can have perfect peace of mind by purchasing your DeskJet 3940v ink cartridges from us as each one is underwritten by a straight forward money back guarantee. Be mindful of the fact that every single purchase also comes with free delivery, usually delivered on the following day! Easy to set up and use, the HP Deskjet 3940v is the last model in the Deskjet 3900 family. It is suitable for everyday printing of text documents to borderless photos, and is good enough for rendering creative projects. 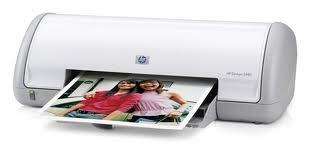 The HP Deskjet 3940v delivers draft speeds of up to 16ppm for black and 12ppm for colour prints. A convenient personal printer, it is not suitable for more demanding printing requirements in an office situation, but is perfectly adequate for home use. The HP Deskjet 3940v looks very much like its 3900 brothers, featuring standard USB interface, front-yield paper tray, and 2 ink cartridge slots for Black and CMY tanks. It measures 5.6x 16.6 x 7.2 inches and weighs just over 4 pounds, making it one of the most portable models in this line. The HP Deskjet 3940v boasts a decent print speed and excellent resolutions of 1200 x 1200dpi for black and white and 4800 x 1200dpi for colour prints. The 384KB RAM allows faster communication between your PC and the HP Deskjet 3940v. It also has 5 print performance modes for versatility. The same issues that plague the 3900 family still plague the HP Deskjet 3940v, namely, high cartridge costs and quick ink consumption, lack of other connectivity options, and paper jams.